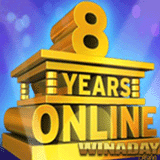 Can you believe it's been 8 years already since Slotland created WinADay Casino, a second one-of-a-kind online casino with its own totally unique games?! This month WinADay is celebrating with its players by giving lots of birthday bonuses and by launching a new game. This week (June 8 – 12) youcan join the birthday party by claiming an up to 75% birthday deposit bonus. If you're a VIP players you can claim up to 200%! This birthday bonuses can be claimed up to three times per day. There’ll be more bonuses each week during the birthday celebrations. Next week is the biggest bonus in a month of birthday bonuses. June 15 – 19 players can claim an up to 250% deposit bonus. With the recent launch of the new Ice Crystals slot, a deluxe game with a Trailing Wild, WinADay Casino now has 33 one-of-a-kind premium slots and 18 unique penny slots. Video poker, Keno and Roulette make for a total of 63 one-of-a-kind casino games. Most are great on Apple and Android smartphones and tablets. A new game is expected before the end of the birthday month. The new game will be called Zodiac but the casino is keeping any other details of the game a secret for a couple more weeks. Birthday bonuses continue through June as WinADay celebrates 8 years of putting smiles on faces all over the world.